You can enter commands and control command processing from the Command Console. You can also change elements in the Command Console window to suit your requirements and preferences. The following applies when entering commands in the command console. The Console is case-sensitive. Therefore, you must enter text in the case required for processing. For example, keywords must be entered in uppercase characters. The Command Console is not interactive. Therefore, you must enter all required commands in sequence and execute them as an entire process. For example, you must enter all steps required to execute the FOCUS REBUILD command. The Console does not prompt you for information. You can copy or cut text from the Command Console or an outside window, and paste it in the Command Console. You can drag and drop command syntax within the Command Console. Click in the Console window, then type and execute commands. Highlight the text you want to paste into the Console window. Select Copy or Cut from the Edit menu. Position the cursor in the Console window and select Paste from the Edit menu. Highlight the text you want to drop into the Command Console. Using the mouse, place the cursor on the selected text, hold down the left mouse button, and drag the cursor to where you wish to place the text. Release the mouse button. The text is placed in the new position. Highlight the text that will be changing and select Change Case from the Edit menu. You may also press ALT+F3, or right-click and select Change Case from the context menu. If the selected text is all lowercase, it will change to uppercase. If the selected text is all uppercase, it will change to lowercase. If the selected text has both uppercase and lowercase characters, the text will change to the case of the first letter it encounters. For example, 'aBC' will change to 'abc', or 'AbC' will change to 'ABC’. Select Undo from the Edit menu or right-click and select Undo from the context menu. Select Redo from the Edit menu or right-click and select Redo from the context menu. Select Find from the Edit menu, press CTRL+F, or right-click and select Find from the context menu. Enter the text you wish to search for in the dialog box and select Find Next. Select Replace from the Edit menu, press CTRL+H, or right-click and select Replace from the context menu. Enter the text you wish to replace in the dialog box and select Replace. Position the cursor where you want to add a comment and select Add Comment from the Edit menu. You may also press CTRL+M, or right-click and select Add Comment from the context menu. Position the cursor where you want to remove a comment and select Remove Comment from the Edit menu. You may also press CTRL+R, or right-click and select Change Case from the context menu. Click Run on the Console window toolbar. 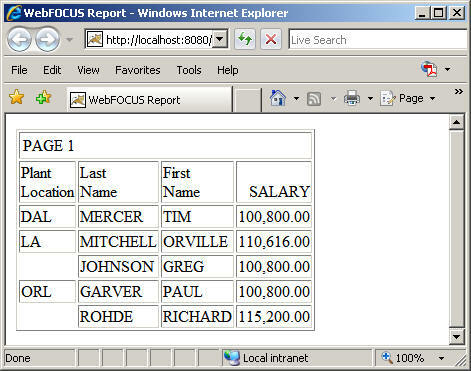 The Command Console window clears and the report appears in the browser window. From the Reporting Server drop-down list in the Command Console window, select the WebFOCUS Environment that will be used to run the request against. This results in the request running against the Reporting Server that is setup as the default in the WebFOCUS Environment. If the environment is setup to access more than one Reporting Server, you can specify which server you want to use by selecting it from the list of servers shown under the WebFOCUS environment, as it appears in the following image. Click the Clear button on the Console Window toolbar. Select Clear Output Window from the View menu. Consider this simple report request run from the Command Console. Enter the following commands in the Command Console window. Click Run. You may also press Ctrl+Enter or F5 to execute the request.